“It’s bulls***,” proclaims Gordon Gekko in 1987’s Wall Street. “I don’t create. I own. We make the rules… We pick that rabbit out of the hat while everybody sits out there wondering how the hell we did it.” The true implications of that statement become apparent in Oliver Stone’s new sequel to that film, Wall Street: Money Never Sleeps. Inspired by the 2008 financial crisis and the resulting recession, the film asks how much bulls*** the economic elite can keep piling on before the world drowns in it. 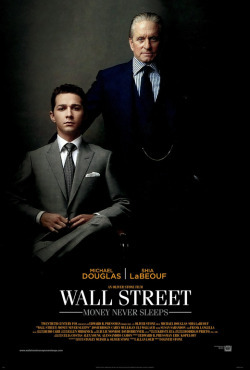 Our protagonist this time around is Jake Moore (Shia LaBeouf), a young Wall Street trader whose mentor commits suicide after rumors spread by a rival (Josh Brolin) cripple his firm’s value. Hungry for revenge, Jake finds a new father figure in the form of Gordon Gekko (Michael Douglas), who famously proclaimed, “Greed… is good” in the original film. After spending two decades in prison, Gekko is eager to reconnect with his estranged daughter Winnie (Carey Mulligan), Jake’s fiancée. The question is whether he’s really a changed man or just the same old shark hoping to use the financial crisis to get back on the top. Douglas is electric. He sinks back into the role that got him an Oscar with ease, bringing a heartfelt sincerity to Gekko’s pleas for forgiveness while retaining a sense of cunning. He may be sorry, but he’s still crafty, and jail gave him a lot of time to think about his next move. Brolin is wonderful, as usual. And Shia LaBeouf holds his own against the veteran actors, proving he was smart to take a year between projects after his disastrous turns in the Indiana Jones franchise and the atrocious Transformers: Revenge of the Fallen.